KOJO has enjoyed a 30 year partnership with Mitsubishi Motors Australia that has seen us provide a range of creative and technical services. Now as Mitsubishi’s digital partner, it’s our responsibility to continually evolve and enhance the online customer experience. Part of that process involves creative direction and management of Mitsubishi’s highly responsive corporate website as well as several other digital platforms which are either integrated directly to the corporate site or act as standalone systems. Our work with Mitsubishi ranges from minor information updates made on a weekly basis, to full-scale online vehicle showroom deployments with new features and functionality. It requires a deep understanding of consumer research, purchase behaviour and global digital and user experience trends, assisting in the creation of an online experience designed to lead visitors seamlessly from research, to test drive, to purchase. Ultimately our aim with everything we do is to positively impact Mitsubishi’s brand, build engagement, collect data, nurture customer prospects, generate price quotes, and encourage new leads. To provide Mitsubishi and its customers with a refreshed user experience, we undertook a complete redesign of the Homepage and Special Offers Page – the most visited pages across the entire website. The new look Homepage featured video functionality and improved funnelling for users to flow through to Vehicle Showrooms and convert to leads. 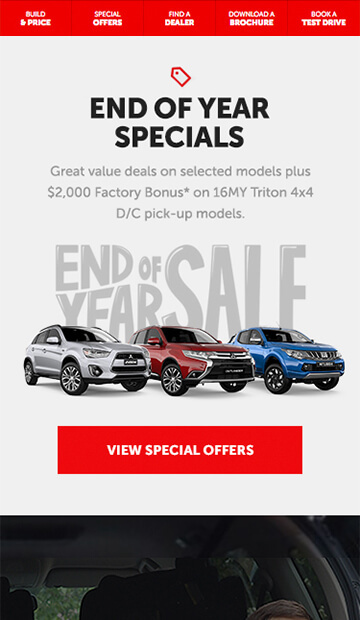 The new Special Offers page included a refreshed design and smart logic, meaning a user’s ‘vehicle of interest’ was provided as the first option shown in the Special Offers section when returning to the site. We rebuilt and redesigned the pricing tool to remove friction for users who are looking to access vehicle pricing. The simple and engaging user interface offers users the ability to customise their preferred vehicle and easily flick through the various options available. The seamless experience provides Mitsubishi with efficient and valuable data capture as well as providing Mitsubishi customers with a quicker and improved pricing tool. From the colour of a car to its interior finishes, users can customise their ride and easily flick through every option available. Users are given the freedom to browse and the confidence to move forward knowing they have access to the most current options. Plus, all additional costs – if any – are shown up front for transparency. We’re always looking for new ways to innovate and evolve the online user experience and the addition of a 360-degree interior experience for the Eclipse Cross is the perfect example. Users are given the opportunity to explore the vehicle in extraordinary detail right from the driver’s perspective.